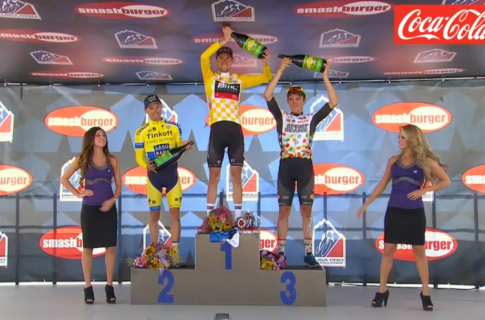 Tejay van Garderen on top of the podium again in the USA Pro Challenge (USA PC photo). Aspen’s Tejay van Garderen is back in command at the USA Pro Challenge cycling race – maybe a day later than he could have been – but still large and in charge heading toward the pivotal Vail Pass Time Trial on Saturday. Van Garderen, the defending champ, shook off Tuesday’s disappointment with a controversial weather-induced race stoppage near Crested Butte in Stage 2, and powered his way to a mountain-top win Wednesday at Monarch Mountain ski area in Stage 3. The racers rode 96 miles from Gunnison over 11,300-foot Monarch Pass, down the other side into Salida for two 9-mile loops and then back up to Monarch ski area at 10,800 feet – the highest finish for any major professional stage race this season. For the second time a fifth-place finisher in last month’s Tour de France, BMC Racing’s van Garderen had to hold off Tour stage-winner Rafal Majka (Tinkoff-Saxo) for the win on Wednesday. But in the process he also dispatched chief rival and two-time defending Tour of Utah champion Tom Danielson (Garmin-Sharp). Van Garderen now has a 20-second lead in the overall chase over the Polish rider Majka heading into Thursday’s 70-mile circuit race in Colorado Springs, which includes 17-percent grades on the infamous Ridge Road. Van Garderen’s BMC teammate Ben Hermans of Belgium sits in third overall, 23 seconds back, and then Danielson, who was third overall in the Pro Challenge last year, is in fourth place at 34 seconds down. Danielson, despite his win Aug. 10 in Utah, said going into Colorado that van Garderen was the favorite, and van Garderen was most leery of Danielson. Now van Garderen says Majka may be more of a threat for the overall title, but in general he’s very confident about where things stand. The race on Friday heads from just outside of Colorado Springs at Woodland Park and travels 104 miles to Breckenridge, and then on Saturday it’s the former Coors Classic stage in Vail, where van Garderen set a course record last year en route to his first Pro Challenge victory. Sunday’s finale travels 78 miles from Boulder to Golden, over Lookout Mountain and then down to downtown Denver.